The V7 Wired Keyboard & Mouse combo provides superior, all-day comfort for demanding interaction. 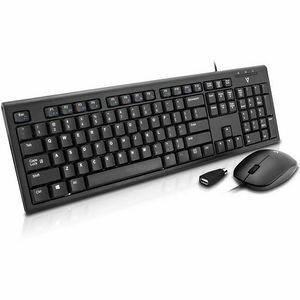 This Full sized keyboard features an attractive design, with The CKU100 full-size, keyboard and mouse combo is built for functionality and all day comfort. It features media hot-keys that allow you to quickly access several basic functions, which is a real time saver, plus it has comfortable, low profile, quiet keys made for hours of use. Featuring a dependable USB wired connection, the CKU100 is the perfect solution for business professionals. The keyboard and mouse combo is designed for durability with a spill-resistant design, and has sturdy, adjustable legs. The mouse boasts a contoured, ambidextrous 3 button design for productivity, plus the thin design of the keyboard keeps your hands relaxed for hours of typing with comfort.